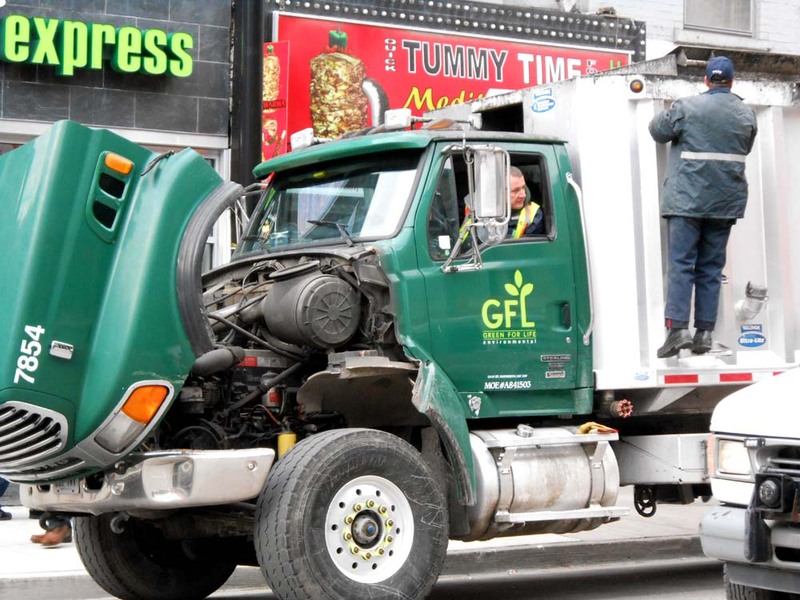 An early morning collision between a Green for Life Environmental garbage truck driven by a 37 year old man and a cyclist left a lady with life threatening injuries in the downtown core. 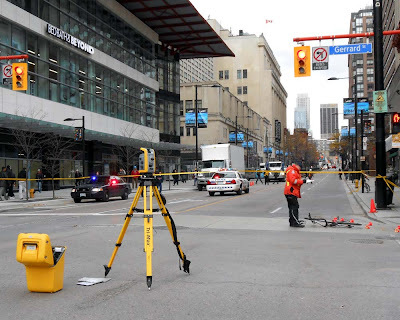 Police from 52 Division report that the they were alerted to the personal-injury accident at 8:44 am on Monday, November 13, 2012. 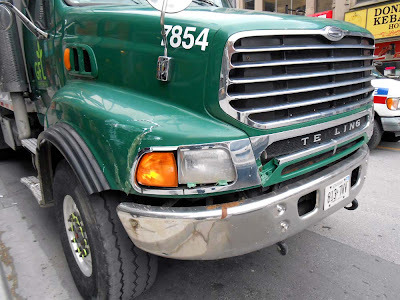 The uneven meeting of vehicles happened at the northeast intersection of Yonge and Gerrard Streets - both were traveling westbound in the north side of Gerrard Street when the truck turned north onto Yonge Street and ran over the 38 year old cyclist. The damaged bicycle remained in the intersection into the afternoon as police closed off Yonge Street and the intersection to undertake the accident investigation. The truck apparently left the scene and witness hopped into a taxi in pursuit. The witness managed to communicate with the truck driver, who returned to the scene - parking in the southbound lanes of Yonge Street, south of Gerrard Street. The truck was being checked out on site by the company's fleet safety personnel while watched over by an police officer. Results of a "Step Up and Be Safe" Toronto Police Traffic Services pedestrian safety campaign were released on the same day as the tragic accident with the intent to reduce injury and death to pedestrians and cyclists with awareness, education and enforcement. 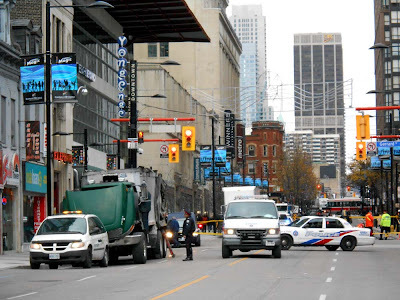 Everyone in the public road allowance is reminded that "safety is everyone's responsibility, obey all traffic laws and be diligent when using our streets". Police identified over 8,500 tickets were issued during week long campaign for the following infractions. 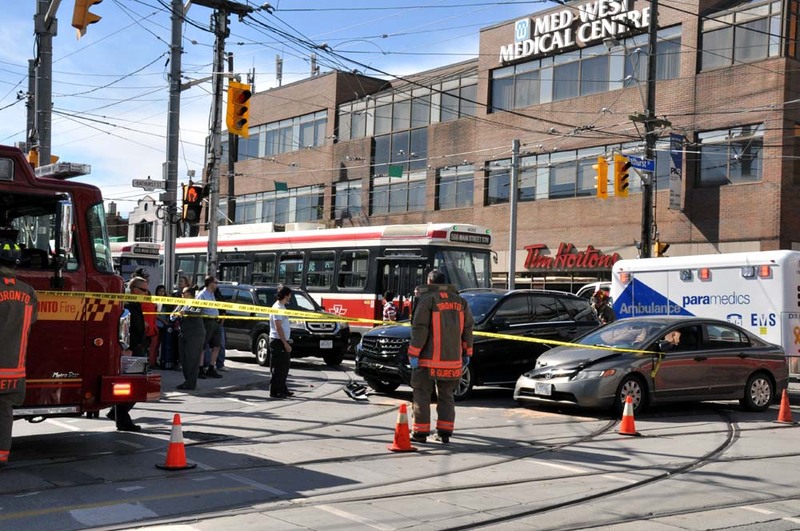 An additional 1,116 parking offences were issued for interfering with the safe use of pedestrian crosswalks, crossovers and school zones. 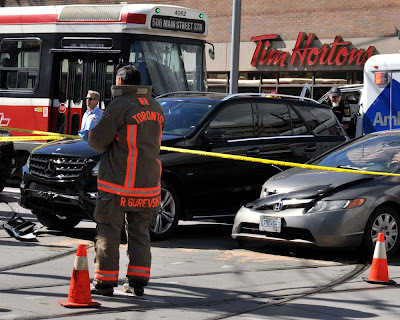 "This year there have been 38 traffic fatalities. 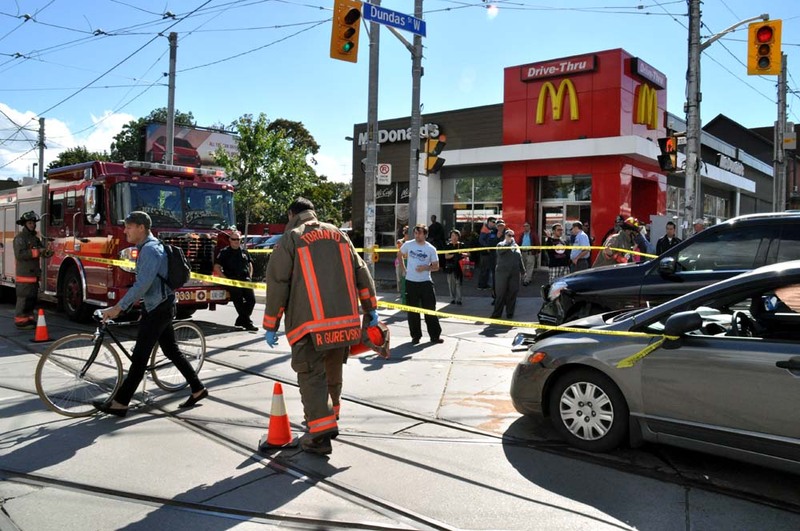 Collision analysis shows that pedestrian fatalities represent approximately 50% of yearly traffic fatalities in Toronto. There have been 19 pedestrian fatalities this year." 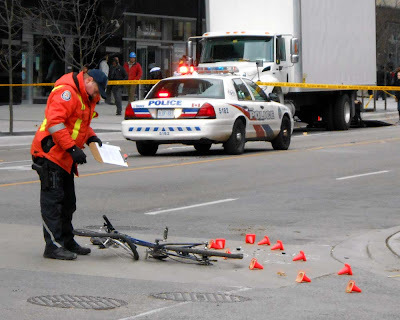 Ironically the City of Toronto was in the midst of controversy with protesters against the removal of an existing bike lane on Jarvis Street. The removal was temporarily halted by a sit-in protest with one of the protesters being arrested. With so many vehicles and pedestrians in our large metropolitan city it is amazing we don't have many more accidents, although you can typically find some bang-ups during a day of biking. Here is the Toronto Fire Department responding to an accident at Dundas and Bathurst Streets (from earlier in the year).